While most musical revues struggle to present a story-like context, here, director Hank Rion treats the show like a magical flashback into the vibrancy of that period. It begins with thunder and lightning. To avoid the rain, a young woman dashes into an old, darkened nightclub. The place mysteriously comes to life showing us the people who once inhabited it. Ms. Evans, a 22 year-old newcomer to community theater, tears it up again and again in this show. She has a powerful voice that is soulful, sassy and filled with so much depth of interpretation, especially in “Mean to Me,” that it belies her youth. Angela Harper cuts a cute presence on stage. Pert and sweet, she is a joy to watch, especially in “How Ya Baby” in which she and Felander Stevenson play a little cat and mouse love game. Mr. Stevenson is one hot talent. He’s the kind of performer who makes it look so easy. Here, his big stand out number is “The Viper’s Drag,” in which euphorically calls out “I dreamed about a reefer five feet long.” A ball of energy, he electrifies the stage with precision, skill and, beneath it all, warm humor. Shari Milian finds the sultry side of the music, especially in “Squeeze Me,” in which she implores her “daddy” to give her some attention. Also on stage is pianist Ernest Williams, who appears for a couple of numbers. And vocal director Kaimi Lucker really wrings tight harmony from the cast. Not missing a beat, of course, is the wonderful pit orchestra conducted by Sue Diebel: clarinetist/alto sax player Charlie Almeida, clarinetist/tenor sax player Scott Martin, trumpet player David Ewing, trombonist Christ Campanelli, bass player David Pawlowski, percussionist Tim Hughes and the pianist, Mason Margut. By the way, Mr. Margut, who is simply outstanding on the piano, is only 18 years old and still a high school senior. Director Hank Rion’s creative team deserves plenty of kudos as well. Costume designer Shannon Reppert dresses the cast in a swanky array of satin, sequins and furs. Lighting and scenic designer David McQuillen Robertson has created the best sets this reviewer has ever seen at the Henegar. A bar, a table and a few chairs, a small stage where a torch singer might have performed, establish the rich atmosphere of the era. Molding carves into the wooden walls. A tin ceiling hangs above. It all is moody and evocative and so appealing. Except for one thing: The mirrored backing of the bar reflects so much light into the audience seated house right that one may end up doing what I did and switch during intermission to a seat on the other side of the house. Choreographer Amanda Cheyenne Manis brings delightfully fresh, character-filled and fun dance to the stage. Indeed, she has a cast who may not be as skilled on the dance floor as are Mr. Stevenson and Ms. Harper, but Ms. Manis nevertheless embroiders the stage with non-stop variety and invention. This is a fun show. It moves so fast you’ll be surprised when curtain call comes. It has wonderful music, engaging performances and fresh faces, both on stage and off. 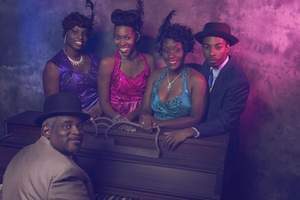 Side o’ Grits: “Ain’t Misbehavin’ “ runs through Feb. 2 at the Henegar Center for the Arts, 625 E. New Haven Ave., Melbourne. $25 general, $22 seniors/military and $16 children 16 years and younger. Call 321-723-8698 or visit www.henegar.org.